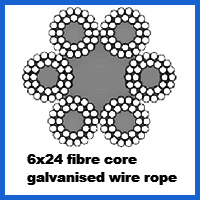 With a thickness of 2 centimetres, this 20mm 6×24 galvanised wire rope manages to reduce its structural rigidity through the use of fibre cores. This lets it make short work of load lashing tasks in marine and forestry environments. Wire rope should be chosen according to its properties, which in the case of this 20mm 6×24 configuration product include flexibility and corrosion resistance. The WLL of this rope sits at almost 22.4 tonnes, while the breaking force of 220kN on the highest quality example is solid without being exceptional for a rope of this diameter. Instead its malleable design allows it to thrive in certain specific contexts, such as when holding together bundles of timber. Corrosion is a problem for many metals, including steel, but thanks to the galvanisation of this rope you will not be stuck with rust spots after periods of wet weather exposure. Rope Services Direct is a purveyor of various galvanised rope products, each of which can be used to make a bespoke assembly at the client’s request. However you intend to use the rope, we can advise you on the best fittings to choose and the right length to opt for. In order to find out more about our galvanised wire rope and the ways it can be harnessed, please give us a ring on 01384 78004 or email the RSD specialist. Our advice is based on years of experience and our quotes are always competitive. 20mm 6x24 Galvanised Wire Rope Overall rating: 5 out of 5 based on 6 reviews.